Blue Line shuttle buses headsigns. This is it, folks: the 30-day closure of four downtown Long Beach Blue Line stations starts Saturday, September 20. During the closure, bus shuttles will replace train service at Downtown Long Beach Station, Pacific Street Station, 1st Street Station and 5th Street Station. The press release from Metro is after the jump. City and elected officials at this morning’s media event in downtown Long Beach. From left, Long Beach Police Chief Jim McDonnell, Councilman Roberto Uranga, Long Beach Transit CEO Kenneth McDonald, Metro Deputy CEO Lindy Lee, Metro Board Member Diane DuBois, Long Beach Mayor Robert Garcia, Long Beach Vice Mayor Suja Lowenthal and Councilwoman Lena Gonzalez. 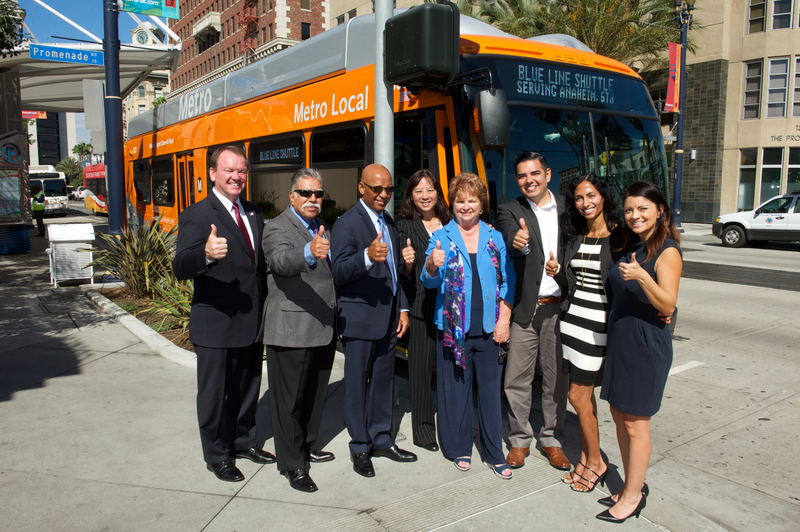 As part of a long-planned $1.2 billion overhaul of the Metro Blue Line, construction activity will center on the downtown Long Beach loop of the light rail system, necessating a 30-day closure and institution of a free bus shuttle to limit inconvenience for commuters, shoppers and business owners beginning Friday, September 20, 2014. Closure of the loop, which includes stations at Fifth Street, First Street, Downtown Long Beach and Pacific Avenue, begins September 20, 2014 with construction scheduled to be complete by October 19, 2014. Improvements will include a second canopy for stations designed with one canopy, new paint and lighting along with sections that will receive new track, track bedding and track switches along with new overhead power lines. The Metro Blue Line is Los Angeles County’s oldest light rail line, linking downtown Long Beach and Downtown Los Angeles since 1990. With its nearly 90,000 weekday boardings, the Blue Line is one of the busiest light rail systems in the United States. “The Blue Line is an important part of our downtown business community and while we see the challenges during the next 30 days, we recognize that station improvements and upgraded infrastructure can only enhance the downtown experience,” said Long Beach Mayor Robert Garcia. To keep commuters and shoppers flowing through the construction zone, Metro will maintain a free bus shuttle during the Blue Line’s regular operating hours. Shuttle buses will begin and end at the Anaheim Street Station, the temporary terminus of the Blue Line. Metro Board member Diane DuBois, also a member of the Lakewood City Council and Gateway Cities Council of Governments said that Metro has planned this overhaul for decades. “Back when the Blue Line opened, planners knew that in about 25 years they would need to replace components and an overhaul would be required to meet evolution in design standards and technology. This upgrade to downtown Long Beach embraces new design, new materials and new, safer standards for passengers and employees,” DuBois said. Disruption to downtown Long Beach business is an issue of concern to City officials and representatives of Metro and Long Beach Transit. One traffic lane might be closed from time to time as conditions warrant, but the contractor plans to schedule most lane reductions during nights and other off-peak hours. According to the Long Beach Police Department, deliveries to local businesses will be limited as some spaces are temporarily lost during the work. The Police Department is working with all parties to make sure their needs are met, but delivery trucks habitually stopped in no-parking zones are subject to citation. “The Metro Blue Line overhaul is a big investment in existing infrastructure even as Metro moves forward on new rail projects,” said Metro Deputy CEO Lindy Lee. Metro has five other projects either under construction or well along in planning, including the Crenshaw/LAX Line, the Expo Line extension to Santa Monica, the Purple Line extension to Westwood, the Gold Line extension to Azusa and the downtown Los Angeles Light Rail Regional Connector. Blue Line improvements are to include nearly $739 million earmarked to purchase 78 new light rail vehicles plus $130 million to repair and upgrade 52 light rail cars now in service. Work has already been completed to replace 20 traction power stations at a cost of $82 million. The Metro Blue Line has 22 stations between downtown Long Beach and the 7th Street/Metro Center in downtown Los Angeles where it connects with the Red/Purple subway lines and the Expo Line. The Metro Blue Line services Los Angeles Trade Technical College, the famed Watts Towers and connects to the Metro Green Line at the Willowbrook station for service to Norwalk and Redondo Beach. The Metro Rail system has about 360,000 daily boardings with 88 miles of track consisting of the Blue Line, the Red/Purple Lines subway connecting downtown Los Angeles and North Hollywood, the Gold Line connecting Pasadena with East Los Angeles, the Green Line and the Expo Line traveling between Culver City and downtown. Commuters can stay informed on all Metro Blue Line updates by checking at metro.net/bluelineupgrades where construction notices and timeline updates are posted. We will continue to update The Source with more information on the project as it progresses. You can also check the Blue Line Upgrades page for work advisories or follow Metro on Twitter @metrolosangeles or @metrolaalerts to get service alerts. Has any consideration been made for counter-clockwise bus shuttles? It’s been discussed, but at this time will not be implemented. We’ll update if anything changes. The Long Beach transit mall was recently redeveloped and 1st street repaved. It is unfortunate that track work wasn’t done before or during the transit mall project. Is there any chance of Metro ever experimenting with the rubber track inserts used at crossings in other parts of the world? Wouldn’t this be a good time to start? That well known difficult and poorly designed crossing on the expo line needs more than any blue line crossing but I have seen a couple of cyclists get stuck in the tracks in downtown LB. When cyclists travelling straight through an intersection are forced to take evasive maneuvers to avoid being hit by a car turning left they may wind up right parallel, next to or on top of the tracks. Normally crossings that involve cyclists travelling perpendicular to the tracks wouldn’t be much of a concern but in a place as hostile to cyclists as LB (which feels and drives like OC) it is.